GOLDENDOODLE: GOLDENDOODLE OWNERS BIBLE is everything you need to know about the Goldendoodle, from Goldendoodle Puppies, Goldendoodle Breeders, Goldendoodle Rescue, bringing your Goldendoodle home, Goldendoodle Dogs as Adults, Goldendoodle Health & Nutrition, Goldendoodle Temperament, Goldendoodle Training, and all the proven INSIDER tips you’ll need to have the best experience with your Goldendoodle. The Goldendoodle is a lively companion and extremely rewarding breed which is also quite unique, as you will learn within. Everything is covered from Goldendoodle Breed history, finding the best Goldendoodle for your particular household, Goldendoodle Puppies and how to pick the best. Miniature Goldendoodles -are they a good idea? Goldendoodle Prices- what can you expect to pay? Goldendoodle Care and keeping your Goldendoodle healthy is all covered. The genetic factors behind Goldendoodle traits - including the f1b Goldendoodle, f2 Goldendoodle, the f2b Goldendoodle it's all uncovered.Importantly the Goldendoodle life stages are covered from Goldendoodle Adolescence through to Adulthood. How to care for your Goldendoodle in old age, and to slow down the process along the way! Susanne covers details on Goldendoodle Vaccinations, Size, Lifespan, and much, much more!Whether you are considering a Goldendoodle for the first time, or a seasoned Goldendoodle owner and lover, the tricks and tips within this guide will prove invaluable. 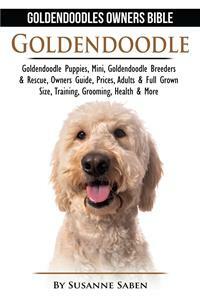 This book is the must-have guide for anybody passionate about Goldendoodles! The book is written in an easy to read and understandable style. In a straight forward, no-nonsense fashion, Susanne Saben covers all aspects of your life with your Goldendoodle and they journey you're about to take together! Disclaimer and Legal Notice. This product is not legal or medical advice and should not be interpreted in that manner. You need to do your own due diligence to determine if the content of this product is right for you. The author, publisher, distributors, and or/affiliates of this product are not liable for any damages or losses associated with the content in this product. While every attempt has been made to verify the information shared in this publication, neither the author, publisher, distributors, and/or affiliates assume any responsibility for errors, omissions, or contrary interpretation of the subject matter herein. Any perceived slights to any specific person(s) or organization(s) are purely unintentional. We have no control over the nature, content, and availability of the websites listed in this book. The inclusion of any website links does not necessarily imply a recommendation or endorse the views expressed within them. DYM Worldwide Publishers takes no responsibility for, and will not be liable for, the websites being temporarily or being removed from the Internet. The accuracy and completeness of the information provided herein and opinions stated herein are not guaranteed or warranted to produce any particular results, and the advice or strategies, contained herein may not be suitable for every individual. The author, publisher, distributors, and/or affiliates shall not be liable for any loss incurred as a consequence of the use and application, directly or indirectly of any information presented in this work. This publication is designed to provide information in regards to the subject matter covered. The information included in this book has been compiled to give an overview of the topics covered. The information contained in this book has been compiled to provide an overview of the subject. It is not intended as medical advice and should not be construed as such. For a firm diagnosis of any medical conditions, you should consult a doctor or veterinarian (as related to animal health). The writer, publisher, distributors, and/or affiliates of this work are not responsible for any damages or negative consequences following any of the treatments or methods highlighted in this book. Website links are for informational purposes only and should not be seen as a personal endorsement; the same applies to any products or services mentioned in this work. The reader should also be aware that although the web links included were correct at the time of writing they may become out of date in the future. Any pricing or currency exchange rate information was accurate at the time of writing but may become out of date in the future. The Author, Publisher, distributors, and/or affiliates assume no responsibility for pricing and currency exchange rates mentioned within this work. Chapter 1 – Goldendoodle History: What is the Origin of the Goldendoodle? Where Did Goldendoodles Come From? How and Why Did the First Goldendoodle Breeders Breed the Goldendoodle Dog? Why Is the Golden Doodle Dog Sometimes Called a ‘Designer Dog’? Are Labradoodles and Goldendoodles the Same? Chapter 2 – Golden Doodles Characteristics: What Sets the Goldendoodle Dog Breed Apart? How Do the F1b Goldendoodle, the F2 Goldendoodle, the F2b Goldendoodle, and the English Goldendoodle Differ from Each Other? Chapter 3 – Finding a Goldendoodle for Sale: What are theThings I Need to Look Out For? How Do I Find and Recognize Good Goldendoodle Breeders? How Do I Weed Out a Bad Goldendoodle Breeder? How Do I Know which to Choose between Goldendoodle Adoption and Goldendoodle Rescue? Chapter 4 – Choosing Goldendoodle Puppies or Adults: Which Do I Take Home, a Goldendoodle Puppy or Adult? How Do I Spot a Quality Pup from Goldendoodle Puppies for Sale? How Do I Know a Goldendoodle Adult Is the Right One? Chapter 5 – Preparing the House for Your Goldendoodle: What Are the Things I Need to Do? How Do I Goldendoodle-Proof My Home? How Do I Choose the Right Goldendoodle Puppy or Adult Food? What Are the Essential Goldendoodle Gear? What Are Great Goldendoodle Gifts? Chapter 6 – Taking Your Goldendoodle Home: What Is the Best Way to Do It? The Trip Back: How Do I Keep My Goldendoodle as Safe and Comfortable as Possible? Introducing Your Goldendoodle to His or Her New Home: How Do I Go About It? Your Goldendoodle’s First Night: How Do I Help Him or Her Adjust? Chapter 7 – Making Your Goldendoodle Part of Your Life: What Is the Right Way? Raising a Goldendoodle: How Do I Raise Mine Properly? Goldendoodle: What Are the Appropriate Things to Do? Disciplining Your Goldendoodle: What Are the Things I Need to Do and Ought Not to Do? Chapter 8 – Caring for Your Goldendoodle: How Do I Do It Correctly? Keeping Your Goldendoodle’s Diet Balanced: How Do I Make Sure My Fur Baby Always Eats Healthy Food? Goldendoodle Grooming: How Do I Keep My Golden Doodle Dog Looking Good? Exercising Your Goldendoodle: How Do I Help My Goldendoodle Stay Fit? Preventive Care and Maintenance for Your Goldendoodle’s Health: How Do I Ensure My Goldendoodle Does Not Get Sick? Chapter 9 – Goldendoodle Training for Beginners or Nonprofessionals: How Do I Do It Effectively? Easy Tricks: How Do I Start? Mid-Level Tricks: What Are the Things to Consider? Hard Tricks: How Do I Make Them as Easy as Possible? Goldendoodle Training Gear: How Do I Pick Out the Best Ones? Chapter 10 – Having Fun with Your Goldendoodle: How Can We Enjoy Time Together but Stay Safe? Having Fun at Home: What Games Are Okay and Not Okay? Having Fun Outdoors: How Do We Play Around Other People and Pets? Giving Your Goldendoodle Toys: What Are the Dos and Don’ts? This quality resource list will help you further maximize your experience with the Goldendoodle breed. Enjoy! Man’s best friend, trusted companion, helper, protector and even confidante—these are but a few of the ways we think of our beloved pet dogs. That said, it could surprise you to know that dogs, as we have come to know them, descend from a mysterious, potentially dangerous and, frankly, scary canine called the gray wolf. Nobody knows for sure when or how it happened, but virtually everybody agrees that the domestication of the gray wolf benefited those who were brave enough to do it, the gray wolves that were nice enough to be tamed, and the rest of mankind. Indeed, we have had very capable help with hunting, herding, and protection against bad elements in the domesticated wolves. In return, we’ve kept them fed, sheltered and safe. A man’s best friend, trusted companion, and protector, the Goldendoodle is a beloved pet dog. Why did we choose the gray wolf for domestication? They are as social as people, so they made for great companions. Wolves, in general, are particularly social animals. Like us, they tend to live in groups, called packs, that have a hierarchy. For example, some wolves rise to become leaders of their respective packs, or claim the leadership, much like we do when we find ourselves in a group. Being so didn’t make it difficult to train them to recognize us as their leader. In the numerous years that passed since the first gray wolves were domesticated, more breeders appeared and altered the canines to suit their needs or preferences. Some bred them to be smaller, cuter, etc. This is why we now have more than 400 dog breeds. The Goldendoodle is currently one of the most popular dog breeds. Many consider it to be the perfect companion dog. This is because it possesses three of the most sought after canine characteristics. They have a: friendly, loving, energetic and playful temperament, above-average intelligence which makes it easy to train, and good looks brought about in large part by its adorable coat which can be soft or silky and curly, wavy, shaggy or straight. It’s also best suited for people who have allergies since its coat is also relatively hypoallergenic. Thus, it would most probably be a surprise to only very few people that you have chosen a Goldendoodle to be your new fur baby, buddy or addition to your family. Currently the most popular dog breed, the Goldendoodle is considered man’s perfect companion. Deciding to make a Goldendoodle part of your life is as exciting, fun and rewarding as it is a big responsibility. Ever heard of the saying that getting a dog is like having a child? This is because both require major adjustments in one’s life for the bond to be created the right way. You need to prepare by reading up on as much as you can about the Goldendoodle, dog-proofing your house, and getting the proper supplies, which include good dog food, grooming tools, and training tools. You also need to learn which type of Goldendoodle is right for you, how to recognize a trustworthy breeder, how to spot a good pup or adult dog, how to take care of your new pet and how to train it. Look no further. All the information you’ll need is right here in this book. Goldendoodle History: What is the Origin of the Goldendoodle? Shaggy but in an irresistible, oh-so-cute way. With small but surprisingly expressive eyes, a delightfully kissable nose and floppy ears which bob while it plays, like pennants waved by a happy child—it is no surprise to us that you have chosen a Goldendoodle as your new pet. That soft, warm, fleece-like coat, those tiny peepers just barely able to peek through that veritable curtain of fringe fur, yet able to convey volumes of emotions, that stand-out whiffer (a slang term for nose) that hones in, digs into and nuzzles almost everything it comes across with unabashed enthusiasm. This is sure to place you under a spell that will make you want to love this dog to bits. Before getting one, it may be good to get know the history and origins of Goldendoodle. To help you get to know your new buddy as well as possible, this chapter teaches you about the origin (i.e., history) of the Goldendoodle dog breed. To be specific, you will learn about where Goldendoodles originally came from, as well as how and why the pioneering Goldendoodle breeders bred the Goldendoodle. You will also learn what a ‘designer dog’ is, and why Golden Doodle dogs are sometimes called designer dogs. Goldendoodles were first bred in the early to mid-1990s in North America and Australia. This was done as an attempt to create guide dogs that were suitable for people who had visual impairments and allergies, like asthma and hay fever. Also called service or assistance dogs, guide dogs are dogs that are trained to help those who are visually impaired get around safely. For example, they can lead their humans around obstacles. Breeds that are trained as guide dogs are chosen based on several criteria, most important of which are trainability and temperament. Nowadays, the German Shepherd, the Labrador and the Golden Retriever are the breeds that are most often chosen to be guide dogs by service animal facilities, followed by the Australian Shepherd, the Border Collie, the Collie, the Visla and the Standard Poodle. Currently, the Labrador Retriever is the most popular breed employed as guide dogs around the world. There are various sizes of it to choose from, keeping it well-groomed is fairly easy due to its short coat, it is generally hearty, it is gentle, and it is easy to train.